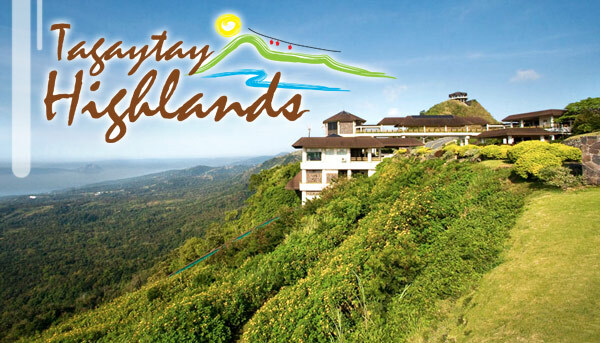 The Tagaytay Highlands Golf and Country Club is proud to stand among the premier golf destinations all across the Philippines.This spectacular property offers the most beautiful scenic landscaping and cool weather all year round as it sits upon the absolute highest elevations of Tagaytay. It is delightfully situated in the prime location of the city where several beautiful hotels are available nearby. Built within a ravine in 1991, this magnificent club has continued to exist as an architectural and structural masterpiece. Its exquisite design has landed it in the top 20 of the Country’s Top 100 Golf Courses. Well renowned golf architect Richard Bigler uniquely designed the 2 world class golf courses with much excellence. Tagaytay Highlands International Golf Club and Tagaytay Midlands Golf Club both boast of their 18-hole championship courses that give players an unusual challenge and exciting experience as they begin at the top amid the Tagaytay Lake and Taal Volcano views, and golf their way down to the bottom of the valley. The course’s tight fairways are made up of the grass that has been deemed the most popular sports turf for the last 40 years- Tifton 419 grass with Tidwarf greens. It is the most durable grass with its dense, rapid growing habit that ensures only the best rounds of golf! Designed with challenging terrain and with drastic elevation changes, these mountain courses are sure to impress any golfer. Even the ferry to the courses provides an adventure with Swiss-engineered cable cars and the country’s first and only 48 seater Swiss Funicular system. When it comes to sports and recreation in the Philippines, the Country Club at Tagaytay Highlands is known to be the finest. Its sports center amenities include a fully-equipped fitness center where every member is welcome and keeps the whole family in mind by offering the clubhouse’s mini-golf course. Adults and children alike are welcome to stay and play the tricky holes that offers fun for everyone. A wide variety of activities are also available including indoor games like tennis and billiards, and outdoor activities like horseback riding and fishing. One will never run out of things to do here! Tired from a long day of golf and sightseeing? Relax in the locker rooms where you can treat yourself to shiatsu and therapeutic body massages then indulge in the appetizing dishes of Gourmet Avenue. Choose between savory Italian food at Toscana or fulfilling Japanese cuisine at Akasaka. Whichever you decide on, you can’t go wrong. 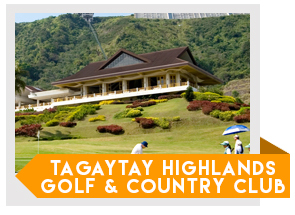 Tip for Tourists: You can still play at Tagaytay Hinghlands International Golf Cub by booking directly with GolfPackages. Fill out the form to your right and get your free quote today.